Scientists at the Wayne State University School of Medicine Department of Ophthalmology at the Kresge Eye Institute are the first to show that the Zika virus (ZIKV) can replicate in the eye’s retinal cells, causing severe tissue damage and even blindness in some cases. 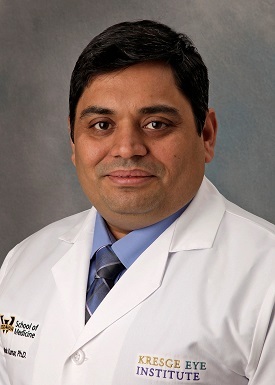 Ashok Kumar, Ph.D., a microbiologist and an assistant professor in the departments of Ophthalmology and of Anatomy and Cell Biology, led a team of researchers to investigate whether ZIKV causes abnormalities in the eye and, if so, how. The answer is published today in JCI Insight, a journal of the American Society for Clinical Investigation. The work was supported by an unrestricted grant from Research to Prevent Blindness, a New York-based health organization supporting research into the causes, treatment and prevention of blinding diseases. The grant is directed by Department of Ophthalmology Chair Mark Juzych, M.D. ZIKV is a significant emergent threat to global health, especially during pregnancy. While not life-threatening, the virus has severe health implications beyond microcephaly, the outbreak’s most publicized health threat. Infants born with congenital ZIKV also have pathology in their eyes, ears, limbs and possibly other organs, Kumar said. Clinical studies show that ZIKV in the eye mainly affects the retina, a layer of cells at the back of the eye that sends signals to the brain to visualize an object. The eye is an immune-privileged organ, so ZIKV could hide there for months, he added. ZIKV has also been shown to cause uveitis, another ophthalmic complication, in adults. The researchers encourage any travelers to inform their primary care physician or ophthalmologist if they have visited an area experiencing a Zika virus outbreak. The team is now looking at how ZIKV modulates a cell to its advantage. Collaborating with another university, the scientists have already identified key genes and molecules they think can attenuate ZIKV, and are working to validate those targets now. Kumar generated his hypothesis for the project last February, after his wife Mamta Kanwar, a microbiologist, co-author on the study and fourth-year medical student at the WSU School of Medicine, brought an article published in the Journal of the American Medical Association Ophthalmology linking ZIKV to cause eye problems to his attention. The WSU-based team worked quickly to get approval for in vitro and animal experiments, launched last summer. Recognizing its importance and impact, JCI Insight accepted the published work, titled “Zika virus infects cells lining the blood-retinal barrier and causes chorioretinal atrophy in mouse eyes,” less than a month after peer review. The study team includes lead author and postdoctoral fellow Pawan Singh, Ph.D.; WSU medical student John-Michael Guest; Ophthalmology resident Joseph Boss, M.D. ; Nan Gao, research associate; Department of Ophthalmology Chair Mark Juzych, M.D. ; Professor of Ophthalmology Fu-Shin Yu, Ph.D.; and Professor of Ophthalmology Gary Abrams, M.D. KEI received funding from RPB in 1960, and has been continuously funded by the organization since 1974, totaling $4.25 million in grants. In addition to funding from Research to Prevent Blindness, the research also was supported by National Eye Institute Center Core Grant for Vision Research P30 grant EY004068-33, given to Department of Anatomy and Cell Biology Chair Linda Hazlett, Ph.D.
Kumar was awarded RPB’s William & Mary Greve Scholar Award in 2011. The mission of Research to Prevent Blindness (RPB) is to preserve and restore vision by supporting research to develop treatments, preventives and cures for all conditions that damage and destroy sight. Since it was founded in 1960, RPB has channeled more than $345 million into eye research. As a result, RPB has been identified with nearly every major breakthrough in vision research in that time. Learn more at www.rpbusa.org.